Washington: More than a decade after the improvised explosive device became the scourge of the wars in Iraq and Afghanistan, the Pentagon is battling another relatively rudimentary device that threatens to wreak havoc on American troops: the drone. Largely a preoccupation of hobbyists and experimenting companies, the vehicles are beginning to become a menace on the battlefield, where their benign commercial capabilities have been transformed into lethal weapons and intelligence tools. Instead of delivering packages, some have been configured to drop explosives. Instead of inspecting telecommunications towers, others train their cameras to monitor troops and pick targets. Instead of spraying crops, they could spread toxic gas, commanders worry. Military strategists envision the day when they will be deployed in robot armies capable of swarming defences in kamikaze raids. The range of their use is “up to the creativity of the enemy”, said Lieutenant General Michael Shields, director of a Pentagon agency called the Joint Improvised-Threat Defeat Organisation (JIDO), which is focusing on countering the drone threat. Last year, the militant group Hezbollah dropped two small bombs over rebel positions in Syria from a commercially available drone. Weeks later, two Kurdish fighters battling Daesh were killed when a small drone they had shot down exploded. 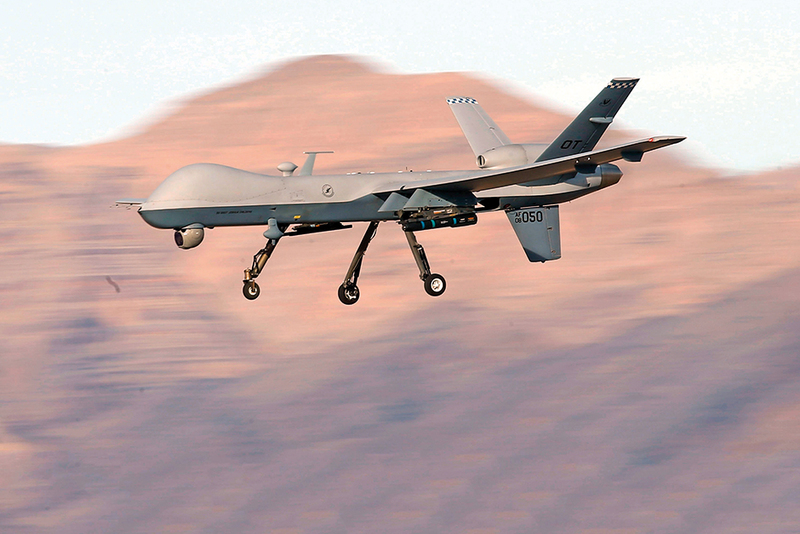 Stopping the drones has become a challenge for the Pentagon and its allies. The unmanned aerial vehicles, as they are known, can range from the size of an insect to a shoebox to a large fixed-wing aircraft. Although they have not been anywhere near as deadly as IEDs, drones could become more lethal as technology improves, military officials fear. In response, the Pentagon is attacking what it sees as a potentially major threat, working to develop lasers and microwaves to blast drones from the sky. Tucked away in a nondescript office park, JIDO’s headquarters is the nerve centre of the effort, tracking incidents around the world and working with academia, start-ups and venture capitalists to stay on top of the latest in drone technology. “It’s almost like the early days of the counter-IED” effort, Shields said. The office opened in 2006 initially to combat IEDs, but as the enemy evolved, so too has JIDO, which now handles all sorts of “improvised threats”, such as vehicle-borne IEDs, suicide bombers, booby traps and, now, drones. “It was a natural progression for us,” Shields said. The change was made because of Daesh’s “use of drones”, he said, adding that the use of drones is a “regional problem and a global problem”. And it’s not just commercially available quadcopters the Pentagon is worried about. “Right now, JIDO is focused on nonstate-actor use of small drones, but there are certainly other capabilities that are out there — larger, faster and so forth,” Shields said. Some soldiers already carry specially outfitted “anti-drone” rifles that, instead of firing bullets, use pulses across radio frequencies that interfere with the vehicles’ controls. France and other countries have trained eagles and other birds of prey to attack enemy drones. While IEDs are cobbled together from mortar and artillery shells found in Afghanistan after decades of war, drones are easily accessible. A search on Amazon.com for “quadcopter” yields more than 80,000 results. And as the technology improves, the drones are becoming more capable. The computer chip giant Intel puts on light shows with fleets of 500 programmed drones that fly in swarms, creating shapes in the sky. At the annual Association of the US Army conference in Washington recently, anti-drone technology was on display on the floor of the convention centre. Nammo, a Norwegian company, showcased a drone that had been blown apart by an “air burst” round — programmed to explode as it reaches its target. Raytheon is taking a different approach, mounting a high-energy laser weapon on top of a militarised dune buggy that it says can be used to take out drones. “Basically, we’re putting a laser on a dune buggy to knock drones out of the sky,” said Ben Allison, director of Raytheon’s high-energy laser product line. The company also has developed what it calls Phaser, a high-powered microwave blast that scrambles a drone’s avionics. Lockheed Martin has a laser it calls Athena that is capable of frying the tail off a fixed-wing drone. And at an Army exhibit, officials showed a small quadcopter with what looked like a small bullet hole in it — that was caused by a laser, not a gun. CACI, the Arlington, Virginia-based defence contractor, is developing a technology it calls SkyTracker that can find and track drones using radio frequencies. If a drone enters a restricted airspace, whether over a military base or a commercial airport, the system could force the drone to land. Or it could commandeer the vehicle and send it back to its operator, a technique that could help law enforcement authorities or soldiers locate the bad guys. Now there are signs that terrorists are moving to drones as a weapon of choice. Daesh has used drones in Iraq and Syria to drop grenades. In Ukraine, Russian-backed separatists used them to help pinpoint where rounds should be fired. Daesh “makes extensive use of drones” army lieutenant general Stephen Townsend told reporters last year. “It’s not episodic or sporadic. It’s relatively constant and creative. And our government is working really hard to come up with solutions.” But, he said, anti-drone technologies have had “varying degrees of success” in addressing what he called a “pretty thorny problem”. Officials are not just concerned about their use on the battlefield. Airports worry about drones interfering with planes. Prisons have seen the vehicles buzz over fences to smuggle in contraband. In 2015, a wayward drone crashed into empty seats at the US Open tennis tournament, and a quadcopter flew by the Secret Service to crash on the White House grounds. And on October 12 in Quebec City, a drone hit a small aeroplane in what officials said was the first such collision in North America. The plane, which was carrying six passengers, landed safely. But the incident raised alarms in Canada and the United States. “There are a lot of drones flying, and there are a lot of people flying drones thinking they’re toys,” Greg McConnell, national chairman of the Canadian Federal Pilots Association, told CTV. The US has been using military drones to great effect for years — and the military’s dependence on them is only growing.